Below you will find a general outline of the seventh major formulation of the repetition spacing algorithm used in SuperMemo. It is referred to as Algorithm SM-11 since it was first implemented in SuperMemo 11.0 (SuperMemo 2002). Although the increase in complexity of Algorithm SM-11 as compared with its predecessors (e.g. Algorithm SM-6) is incomparably greater than the expected benefit for the user, there is a substantial theoretical and practical evidence that the increase in the speed of learning resulting from the upgrade may fall into the range from 30 to 50%. In addition, Algorithm SM-11 eliminates problems with repetition delay and repetition advancement evident in Algorithm SM-8. SuperMemo begins the effort to compute the optimum inter-repetition intervals by storing the recall record of individual items (i.e. grades scored in learning). This record is used to estimate the current strength of a given memory trace, and the difficulty of the underlying piece of knowledge (item). The item difficulty expresses the complexity of memories, and reflects the effort needed to produce unambiguous and stable memory traces. SuperMemo takes the requested recall rate as the optimization criterion (e.g. 95%), and computes the intervals that satisfy this criterion. The function of optimum intervals is represented in a matrix form (OF matrix) and is subject to modification based on the results of the learning process. Although satisfying the optimization criterion is relatively easy, the complexity of the algorithm derives from the need to obtain maximum speed of convergence possible in the light of the known memory models. Important! Algorithm SM-11 is used only to compute the intervals between repetitions of items. Topics are reviewed at intervals computed with an entirely different algorithm (not described here). To sum it up. Repetitions result in computing a set of parameters characterizing the memory of the student: RF matrix, G-AF graph, and FI-G graph. They are also used to compute A-Factors of individual items that characterize the difficulty of the learned material. The RF matrix is smoothed up to produce the OF matrix, which in turn is used in computing the optimum inter-repetition interval for items of different difficulty (A-Factor) and different number of repetitions (or memory lapses in the case of the first repetition). Initially, all student’s memory parameters are taken as for a less-than-average student (less-than average yields faster convergence than average or more-than-average), while all A-Factors are assumed to be equal (unknown). Optimization solutions used in Algorithm SM-11 have been perfected over 17 years of using the SuperMemo method with computer-based algorithms (first implementation: December 1987). This makes sure that the convergence of the starting memory parameters with the actual parameters of the student proceeds in a very short time. In addition, Algorithm SM-11 includes mechanisms that make it insensitive to interference from the deviation from the optimum repetition timing (e.g. delayed or advanced repetitions). It can also accept uninitialized learning process imported from other applications (e.g. other SuperMemos). 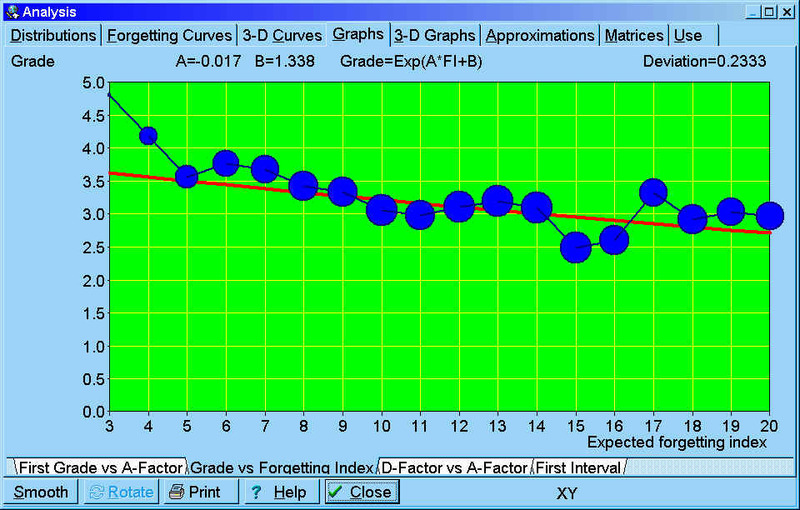 The introduction of A-Factors and the use of the G-AF graph greatly enhanced the speed of estimating item difficulty. The adopted solutions are the result of constant research into new algorithmic variants. The theoretical considerations, as well as the research into the employment of neural networks in repetition spacing indicates it is not likely neural networks could effectively compete with the presented algebraic solution (see FAQ below). Algorithm SM-11 is constantly being perfected in successive releases of SuperMemo, esp. to account for newly collected repetition data, convergence data, input parameters, instabilities, etc. How does SuperMemo compute the optimum increase in intervals? Will SuperMemo use neural networks? RF stands for "retention factor"
I noticed that A-Factor may decrease even if the grade is Bright. Is this correct? In other words, neural networks could be used to compute the intervals, but they do not seem to be the best tool in terms of computing power, research value, stability, and, most of all, the speed of convergence. When designing an optimum neural network, we run into similar difficulties as in designing the algebraic optimization procedure. In the end, whatever boundary conditions are set in "classic" SuperMemo, are likely to appear, sooner or later, in the network design (as can be seen in: Neural Network SuperMemo). As with all function approximations, the choice of the tool and minor algorithmic adjustments can make a world of difference in the speed of convergence and the accuracy of mapping. Neural networks could find use in mapping the lesser known accessory functions that are used to speed up the convergence of the algebraic algorithm (e.g. user-dependent grade correlations that speed up the approximation of A-Factors, etc.). It is not true that SuperMemo is prejudiced while a neural network is not. Nothing prevents the optimization matrices in SuperMemo to depart from the memory model and produce an unexpected result. It is true, that over years, with more and more knowledge of how memory works, the algorithm used in SuperMemo has been armed with restrictions and customized sub-algorithms. None of these were a result of a wild guess though. The progression of "prejudice" in SuperMemo algorithms is only a reflection of findings from previous years. The same would inevitably affect any neural network implementation if it wanted to maximize its performance. It is also not true that the original pre-set values of optimization matrices in SuperMemo are a form of prejudice. These are an equivalent of pre-training in a neural network. A neural net that has not be pre-trained will also be slower to converge to the optimum model. This is why SuperMemo is "pre-trained" with the model of an average student. I am reading your article about the two-components of long term memory. I understand that your learning software SuperMemo uses the described model to optimize learning. I am curious how SuperMemo computes the constant C2 from the Equation 2 (i.e. how does it know how much intervals should increase)? Equation 2 is only a vastly simplified reflection of functions actually used in SuperMemo. The simplification was needed to prove the existence of two independent variables required to describe the status of simple memories: stability and retrievability. Due to those multiple dependencies, the precise value of C2 is not easily predictable. SuperMemo solves this and similar optimization problems by using multidimensional matrices to represent multi-argument functions and adjusting the value of those matrices on the basis of measurements made during an actual learning process. The initial values of those matrices are derived from a theoretical model or from previous measurements, the actually used values will, over time, differ slightly from those theoretically predicted or those derived from data of previous students. For example, if the value of C2 for a given item of a given difficulty with a given memory status produces an inter-repetition interval that is longer than desired (i.e. producing lower than desired level of recall), the value of C2 is reduced accordingly. in the paper-and-pencil version of SuperMemo (1985), C2 was indeed (almost) a constant. Set at the average of 1.75 (varying from 1.5 to 2.0 for rounding errors and simplicity), it did not consider material difficulty, stability or retrievability of memories, etc.